LASIK or Lasik (laser-assisted in situ keratomileusis) is a type of refractive surgery for correcting myopia, hyperopia, and astigmatism. LASIK is performed by ophthalmologists using a laser. LASIK is similar to other surgical corrective procedures such as photorefractive keratectomy, PRK, (also called ASA, Advanced Surface Ablation) though it provides benefits such as faster patient recovery. Both LASIK and PRK represent advances over radial keratotomy in the surgical treatment of vision problems, and are thus viable alternatives to wearing corrective eyeglasses or contact lenses for many patients. The LASIK technique was first made possible by the Colombia-based Spanish ophthalmologist Jose Barraquer, who, around 1950 in his clinic in Bogotá, Colombia, developed the first microkeratome, and developed the technique used to cut thin flaps in the cornea and alter its shape, in a procedure he called keratomileusis. Barraquer also researched the question of how much of the cornea had to be left unaltered to provide stable long-term results. 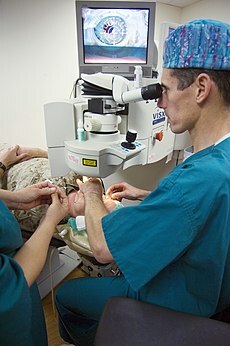 Later technical and procedural developments included RK (radial keratotomy), developed in the USSR in the 1970s by Svyatoslav Fyodorov, and PRK (photorefractive keratectomy), developed in 1983 at Columbia University by Dr. Steven Trokel, who in addition published an article in the American Journal of Ophthalmology in 1983 outlining the potential benefits of using the excimer laser patented in 1973 by Mani Lal Bhaumik in refractive surgeries. (RK is a procedure in which radial corneal cuts are made, typically using a micrometer diamond knife, and is completely different from LASIK). In 1968 at the Northrop Corporation Research and Technology Center of the University of California, Mani Lal Bhaumik and a group of scientists were working on the development of a carbon-dioxide laser. Their work evolved into what would become the excimer laser. This type of laser would become the cornerstone for refractive eye surgery. Dr. Bhaumik announced his team’s breakthrough in May 1973 at a meeting of the Denver Optical Society of America in Denver, Colorado. He would later patent his discovery. The general term for changing a patient’s optical measurements by means of an operation is Refractive Surgery. The introduction of lasers in refractive surgeries stemmed from Rangaswamy Srinivasan‘s work. In 1980, Srinivasan, working at IBM Research Lab, discovered that an ultraviolet excimer laser could etch living tissue in a precise manner with no thermal damage to the surrounding area. He named the phenomenon Ablative Photodecomposition (APD). The use of the excimer laser to ablate corneal tissue for the correction of optical errors, such as myopia, hyperopia, and astigmatism, was first suggested by Stephen Trokel, MD, of the Edward S. Harkness Eye Institute, Columbia University, New York, NY. Dr. Trokel, along with Dr. Charles Munnerlyn and Terry Clapham, founded VISX, Incorporated. The first human eye was treated using a VISX laser system by Dr. Marguerite B. MacDonald, MD in 1989. The first patent for LASIK was granted by the U.S. Patent Office to Dr. Gholam A. Peyman on June 20, 1989, U.S. Patent #4,840,175, "method for modifying corneal curvature," encompassing the surgical procedure in which a flap is cut in the cornea and pulled back to expose the corneal bed. The exposed surface is then ablated to the desired shape with an excimer laser, after which the flap is replaced. The LASIK technique was successfully applied in other countries before it arrived to the United States. The first U.S. Food and Drug Administration (FDA) trial of the excimer laser was started in 1989. The first use of the laser was to change the surface shape of the cornea, known as PRK. Summit Technology, under the direction of its founder and CEO, Dr. David Muller, was the first company to receive FDA approval for an excimer laser to perform PRK in the US. The LASIK concept was first introduced by Dr. Pallikaris in 1992 to the group of ten surgeons who were selected by the FDA to test the Visx laser at 10 centers in the U.S. In 1998, the Kremer Excimer Laser serial #KEA 940202 received FDA approval for its singular use to perform LASIK in the US. Subsequently, Summit Technology was the first company in the US to receive FDA approval to mass manufacture and distribute excimer lasers to perform LASIK and Visx and several other manufactures then followed. Dr. Pallikaris theorized the benefits of performing PRK after the surface was raised in a layer to be known as a flap performed by the Mikrokeratome developed by Barraquer in 1950. The blending of a flap and PRK became known as LASIK, which is an acronym. It quickly became very popular, since it provided immediate improvements in vision and involved much less pain and discomfort than PRK. Today, faster lasers, larger spot areas, bladeless flap incisions, intraoperative pachymetry, and wavefront-optimized and -guided techniques have significantly improved the reliability of the procedure compared to that of 1991. Nonetheless, the fundamental limitations of excimer lasers and undesirable destruction of the eye’s nerves have spawned research into many alternatives to "plain" LASIK, including LASEK, Epi-LASIK, sub-Bowman’s Keratomileusis aka thin-flap LASIK, wavefront-guided PRK and modern intraocular lenses. LASIK may one day be replaced by Femtosecond laser intrastromal vision correction via all-femtosecond correction (like Femtosecond Lenticule Extraction, FLIVC, or IntraCOR), or other techniques that avoid permanently weakening the cornea with incisions and deliver less energy to surrounding tissues. One thermobiomechanical alternative, Keraflex, recently received the CE Mark for refractive correction, and is in European clinical trials for the correction of myopia and keratoconus. The 20/10 (now Technolas) FEMTEC laser has also recently been used for incisionless IntraCOR ablation on several hundred human eyes and achieved very successful results for presbyopia, with trials ongoing for myopia and other conditions.